Day 29: City of Industry – The San Francisco Bay Trail: It's Closer Than You Think! Dogpatch. Even the name exudes cool. It was suggested that I finish my trip early and wrap up the final five miles from Islais Creek to the Ferry Building today. Not to be. This is not a neighborhood to blow through at a four mile an hour pace for the sake of expediency. This is a neighborhood to be savored. Walk it slowly and the let the sights and idiosyncrasies come to you. If your peripheral vision pulls you in one direction, follow its lead and go with it. This is how a two mile walk can take two hours. I have been looking forward to this section of Bay Trail for 28 days, knowing it well but not well enough. My last trek through these parts was with my Pentax K-1000 nearly ten years ago. There was a light leak through the back of my camera and most of my black and white images were of no value. Also, I had no clue what I was doing. I just knew the subject matter was fascinating. Fast forward ten years and a lot has changed. A neighborhood has emerged from this industrial warehouse district just east of Potrero Hill. I-280 acts as a moat between the two with Mariposa Street serving as an umbilical chord. Who is attached to who by this chord is no longer clear. New restaurants share a zip code with old classics. Doggie daycare businesses now service the full-time residents who have moved into new luxury condo and loft developments. Yet, classic Victorians still have a place here, dotting Tennessee Street and sharing a zip code with a motorcycle club that favors Harleys and gives out teddy bears at Christmas. This history of Dogpatch and the Central Waterfront is not unlike that of one of my new local faves, Point Richmond. Shipbuilding and the Port once dominated this stretch of San Francisco shoreline. And shipbuilding – as in AC72 ship-building – still has a presence here. Some old school yacht clubs, not of the AC72 variety, still occupy space and The Ramp serves a die-hard group of loyal “in the know” weekend brunchers. On any given weekend you will find Dolphin and South End Rowing Club members pulling up in their old wooden row boats, having ridden the flood tide in from Aquatic Park. After a few Bloody Marys (quite a few), they will ride the ebb back. 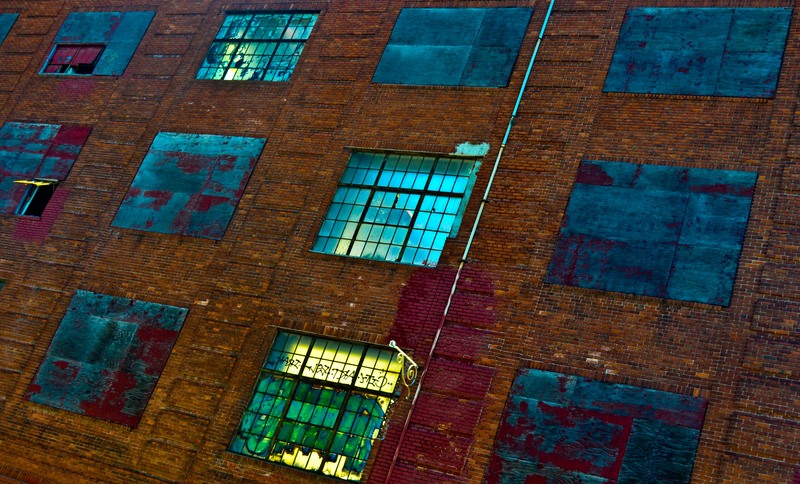 The old brick and corrugated steel warehouses dot the alleys one block east of Illinois Street and some heavy industry businesses still operate at the water’s edge. Tomorrow I will emerge from Dogpatch and the Central Waterfront and make my way down the home stretch to the Ferry Building. My final three miles represents less than 1% of the 313 I will have put on my feet since May 31st. What an amazing journey it has been. I might take tomorrow off from the blogosphere – my first in 3o days – and just gel for twenty four hours. But stay tuned – there are more trails to be conquered! Have an idea? I am all ears – and feet. Previous postThe Photo Gallery is Complete!